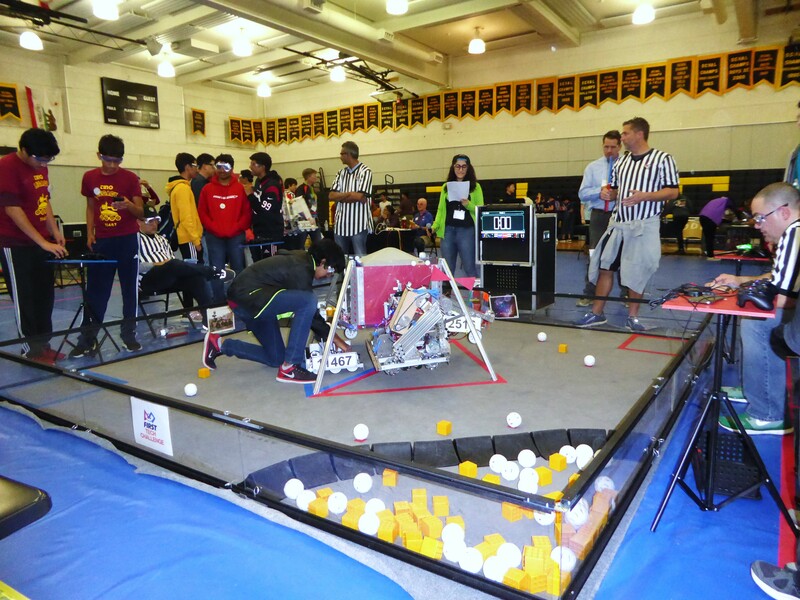 Robopocalypse, the Adrian Wilcox High School varsity robotics team, was undefeated in all five of its matches at the 2018-2019 NorCal FIRST Tech Challenge NASA Qualifier Tournament on Jan. 13. In five years of competition, it was Robopocalypse’s first time to win an undefeated first place. Rover Ruckus was the 2018 – 2019 challenge set by FIRST (For Inspiration and Recognition of Science and Technology), the national nonprofit that oversees the robotics competitions. The challenge for each robotics team was to program its robot to detach itself from a lunar lander then identify and mine for “gold” and “unobtainium” in a 12-foot by 12-foot landing field. With two team members operating the hand controls, the robot had to load the precious metals it collected into the lander, plant a marker in a corner, and reattach itself to the lander — all in two-and-a-half minutes. Because of the national government shutdown, the Bay Area tournament took place at Notre Dame High School in Belmont instead of at NASA in Mountain View. Winning the competition qualified Robopocalypse to participate in the regional tournament on March 3 at Independence High School in San Jose. “I’m so proud of them that I burst all the buttons off my shirt,” said Karen Hardy, Wilcox teacher and robotics team co-coach with Suds Jain. Hardy was also proud of the newly-established freshman team, Roblivion. It won a “Judges’ Special Award” for the tenacity its 15 team members showed when they had trouble with their robot — they didn’t give up. 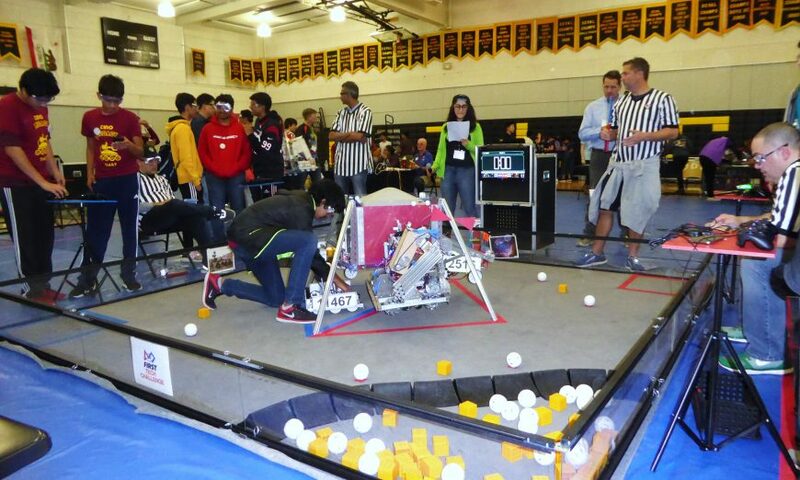 The Wilcox High School Robotics Club hosted 28 Bay Area high school robotics teams Jan. 19 for the 2018-19 FIRST Tech Challenge Santa Clara Qualifier Tournament. Sixty volunteers, including club alumni, facilitated the event. Alumnus Parth Atre, a freshman at UC Santa Barbara, was on the Wilcox Robotics Team for three years. “Being on the team made me more partial to the design aspect of engineering,” said alumnus Nikhil Gupta, who plans to go into neuroprosthetics (devices that supplant or supplement the input or output of the nervous system). Roblivion team member Gayatri, a freshman, is following in the footsteps of her sister Srividya — the first Wilcox girl to join the robotics team. Gayatri explained that being on the robotics team is as much a commitment as being part of a traditional school sports team. Robotics team members devote a couple hours daily after school to robotics. “After doing it, I realize it’s really interesting. It’s worth it to put in the effort if it’s a passion you want,” said Gayatri, who is aiming for a career in the field of science. “What’s cooler than robots? !” declared robotics coach Jain. Jain explained that FIRST was founded in 1989 to draw students into STEM (science, technology, engineering and math) careers by showing them that robotics is a fun, exciting field. Students were missing out on STEM careers because of a lack of exposure. Sponsors of the Wilcox robotics teams are 02 Micro, the Rotary Club of Santa Clara, Intuitive Surgical, Solidworks and generous parents. To get involved as an individual volunteer or corporate sponsor, contact Hardy at khardy@scusd.net. For Wilcox Robotics Club information, visit www.wilcox-robotics-team.com. 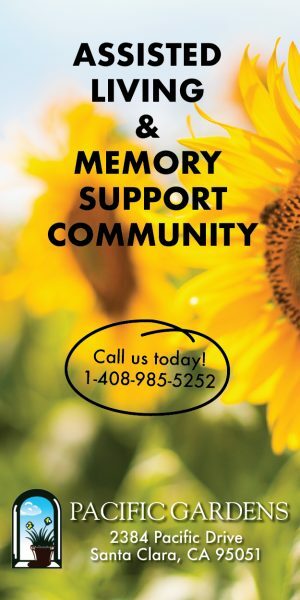 Visit www.firstinspires.org for information about FIRST and www.norcalftc.org for FIRST in northern California.